Which is why we choose a premium lens manufacturer like HOYA. For 75 years, Hoya’s revolutionary technologies have been pushing the boundaries of optical solutions for customers on a global scale. They are truly leaders and innovators in the use of the latest medical insights and cutting edge manufacturing techniques. Their ‘eye for detail’ strap-line fits perfectly with their dedication to quality and innovation. 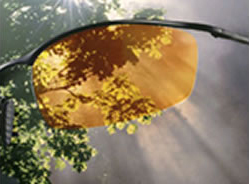 They produce lenses which are thinner, lighter and stronger to suit the frame style choices of today. Lens designs are evolving all the time and we try many new designs out ourselves before we recommend them to our clients. Hoya’s comprehensive range of corrective lenses ensure we can find the perfect lens for your individual vision needs. Choosing what is unique to you. 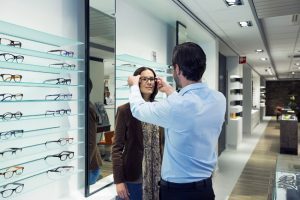 Our expert dispensing team will guide you through the most appropriate lens for your frames, budget and lifestyle – be it enhancing your golf game or playing in an orchestra, we will recommend the best lenses that are specifically designed to suit your individual prescription, frame choice, and lifestyle requirements. Which type of lens would be best for me? Have one single prescription across their entire surface and provide the widest field of view for a specific visual task. 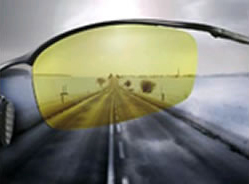 For example; distance lenses for driving, intermediate lenses for computer use or reading lenses for close work. When vision correction is needed and you have a simple refraction. You may already wear bi-focal or varifocals lenses that enable to you see near and distance particularly in outdoor environments. There are times when you need to focus close up for longer periods of time and where you are using your near and middle distance vision (especially in work situations). 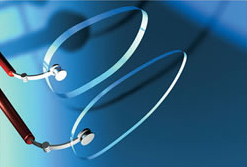 Occupational (indoor) lenses are best suited when sharp vision is required for close distance activities such as intensive reading, computer work, office work and also specialist professions which demand the highest resolution, contrast and visual perception. The indoor range (or occupational lenses) is the perfect solution. The biggest advancement in recent lens development is in the area of personalised varifocals. Varifocals combine near, middle-distance and distance vision in one lens making it ideal to wear one pair of spectacles for many of your daily activities. These lenses are specifically designed to suit your individual prescription, frame choice and lifestyle requirements. 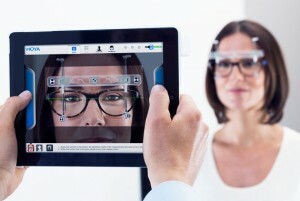 Our Digital measuring technology is utilised to fully customise your varifocal lenses to your frame shape and face shape, offering you a truly unique and bespoke solution to your needs. Polarised lenses contain a special filter that blocks out the intense light which is reflected from flat surfaces and causes irritating glare. These lenses are particularly useful in certain sports or leisure situations, such as sailing or angling, where light reflected from the waters’ surface can cause debilitating glare. 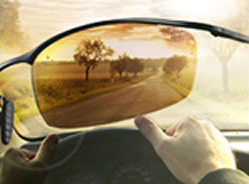 Polarised lenses are also particularly good for driving as glare is produced by the reflection of light from long flat road surfaces. Photochromic lenses react to ultra-violet light. The technology allows them to adapt to changing light conditions – going darker when there is more UV light outdoors, and fading back when indoors. This means that the lenses provide the correct amount of protection for the varying light conditions the wearer experiences. Because UV light rays can penetrate clouds, photochromic lenses can darken on overcast days as well as sunny days. Polarised and photochromic lenses are available in most prescription types, including varifocals. These include scratch resistant and anti-reflection coatings. High quality anti-reflection coatings from Hoya ensure that a lens is clearer by virtually eliminating reflections from the surface of the lens. Thus the annoying reflections from car headlamps at night or from the computer screen are significantly reduced. An anti-reflection coating also reduces the ‘glassy’ look of a spectacle lens that is particularly noticeable in photographs. Precision digital measuring of your spectacles. Simulation of different lens types and how you will actually see through your chosen lenses. This is called Augmented Reality. A frame selection tool which enables you to have images or video taken of you in frames. A particular advantage for patients who are very short sighted and want to see how they look in their selection of frames. Bespoke range of measurements, unique to you, ensuring you get the best vision every time.